Over the knee boots are a big trend this season. It’s a style I’m always crazy for come autumn; I think they look amazing with dresses and mini skirts, and have the added bonus of keeping your legs warm when it’s cold out. My current ones are from a couple of years ago and have seen better days, so I was in need of a new pair. I managed to get this particular pair from Asos before they quickly sold out. As previously mentioned, I struggle with heels, and a lot of OTK boots have quite a high heel on them. As it’s a style I love so much I wanted a flat pair that I could easily wear every day, even on the bad days I have with the pain, which is why I chose these. 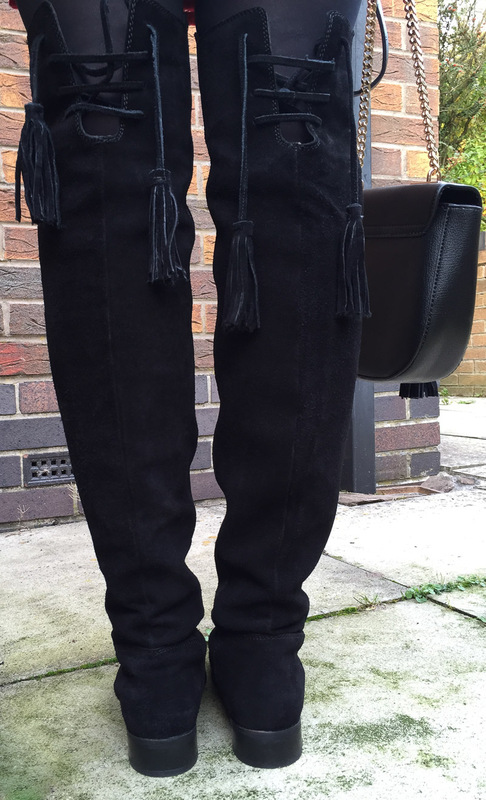 They also have lace up detailing at the back of the knee with tassels, another popular style accent at the moment thanks to the seventies influence that designers and the high street alike have been loving all year long. If you’re going to embrace them, suede is the material of choice. And you’d be surprised at just how versatile they are. If you opt for a heeled version they’re great for evening with your favourite party dress whilst also working for day time too. Style them however you want! With dresses and skirts a shorter length is best to really showcase the boot, or you can wear them over jeans with a knitted jumper for a casual look. I’ve shown them here with a red checked A-line mini skirt which I chose to give a sixties feel, and a black turtle neck, an essential transitional piece for your wardrobe this season. This particular one has a ribbed body and has eyelets at the neckline which I absolutely love, it adds just a bit of something extra to it. The wind made my hair go all static for some reason when I took these photos, so I’m sorry about that! 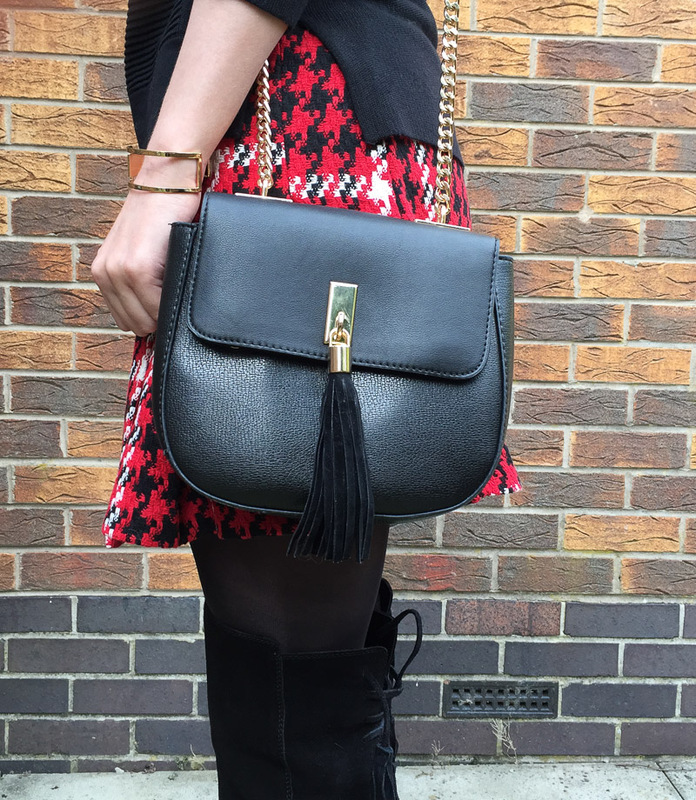 My black saddle bag is Topshop’s version of the utterly drool worthy Chloe Drew bag. It’s the perfect size for me and the tassel they’ve added is such a cute detail. I want it in every colour. I may have just bought it in tan as well. Are you a fan of over the knee boots? How are you wearing yours?